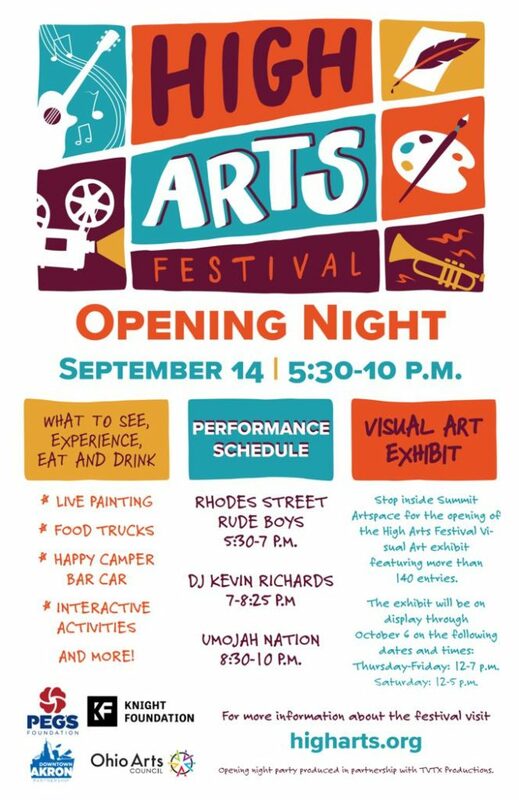 Friday, Sept. 14, is the High Arts Festival Opening at Summit Artspace on East Market. The festival, organized by the Akron Downtown Partnership, celebrates the excellence of the arts community through peer-to-peer assessment, connecting new audiences to local art and individual artists, and increasing the awareness of the vibrant artistic hub that exists in downtown Akron. The public will continue to vote for favorites in each category via a mobile app or kiosks in participating venues. 142 visual art pieces at Summit Artspace Thursdays through Saturdays from 12 to 7 p.m. between Sept. 14 and Oct. 6. Visual art weekend kicks off at Opening Night on Sept. 14, 5:30 to 10 p.m.
Or visit our event calendar at summitartspace.org/event. Follow HIgh Arts on Facebook to stay up-to-date and share your experiences – and with #HighArtsFest on Twitter and Instagram. See the Summit Artspace exhibit calendar for open hours for High Arts Visual Arts.